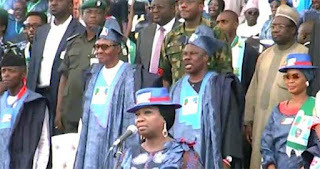 The All Progressives Congress has vowed to punish the Ogun State Governor, Ibikunle Amosun, for allegedly hiring thugs that attacked President Muhammadu Buhari and party leaders at Monday’s campaign rally of the party in Abeokuta. Expressing regrets at the disruption of the campaign, the APC National Publicity Secretary, Mallam Lanre Issa-Onilu, in a statement on Tuesday said that those responsible for the “premeditated attacks” would be dealt with. Issa-Onilu said, “The All Progressives Congress (APC) regrets Monday’s premeditated attacks sponsored by Governor Ibikunle Amosun on President Muhammadu Buhari and other senior party leaders at the venue of the presidential campaign rally in Ogun State. “This is one act of indiscipline too many. The APC will not condone acts of indiscipline, indiscretion, and anti-party activities from any party member no matter how highly placed. “We urge our teeming party supporters and members not to be disturbed by Monday’s condemnable incident. We urge all to continue trooping out en masse for our remaining campaigns and vote massively for all and only APC candidates in the forthcoming general elections,” the statement added.